… than already has been achieved with the soulution 710 stereoamplifier, seems to be im­possible. Still, the new soulution 711 significantly out­per­forms its prede­cessor in all disciplines! The new “switched mode” power supply technology brings the soulution 711 to new level of per­formance. Improve­ments on the test bench get confirmed by the performance in the listening room. Words alone cannot convey the per­for­mance and sheer acoustic presence of the soulution 711 stereo­amplifier. We’ve combined the ultimate technical specification and highest possible performance with just one aim – to liberate the best the music has to offer. Listen like never before. Marvel. Enjoy. Without limits. The ideal amplifier is perfectly load stable, 100% level and phase accurate, and has no long signal paths. It should not use tricks like over amplification and very high negative feedback to achieve good results in the lab but poor sonic per­for­mance in the listening room. 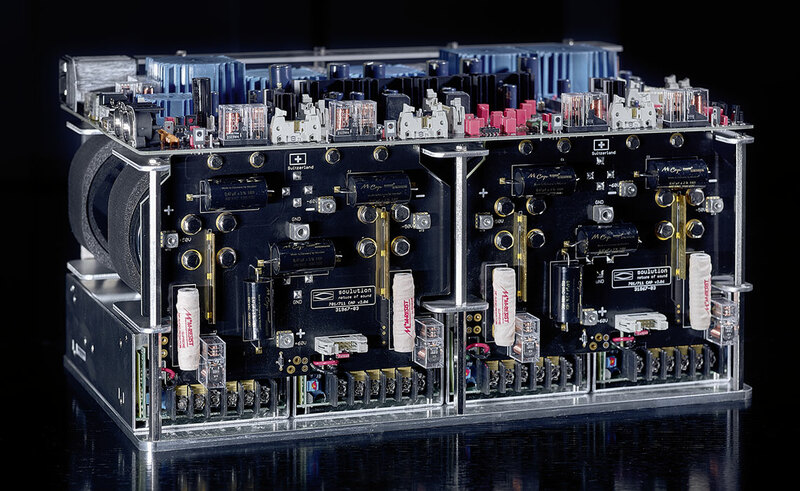 The soulution 711 stereo­amplifier combines extreme speed with an ultra-wide band­width (1 MHz/– 3 dB) and a high current capability far beyond that of valves and output trans­formers. A unique and sophisticated circuit design opens up sonic qualities once considered incompatible: Precision, Velocity, Stability and Power. In the soulution 711 they are brought together for the first time – all in the pursuit of musical perfection. The soulution 711 is closest of all to this ideal. It can provide up to 300 Watt continuous power into 4 Ω and more than 6,000 Watt transient power per channel. More than enough to breathe new sonic life into even the most demanding, low-efficiency loudspeakers. Throughout, the soulution 710 is designed as a consistent dual-mono layout. Both left and right channels feature identical audio amplifiers, each with its own high efficiency power supply. The housing forms an integral part of the design providing cooling for the output stages and damping to minimize microphonic interference. From the input the soulution 711 first buffers the music signal. A high performance correction amplifier is then used to capture and correct any deviations in the signal, very quickly and very precisely. Ultra wideband amplification using no feedback loops follows, a less than 10 nanosecond transit time and level accuracy to within 0.1 dB ensuring signal purity. The whole is housed within a sealed module, maintaining a common temperature across all stages to further guarantee precision. The output stage comprises 14 power transistors per channel, all mounted onto a massive copper rail which is temperature controlled for a constant quiescent current. The soulution 711’s impressive low level signal handling is reflected in its raw power delivery. Current levels of 120 A and more are readily attainable. A stable supply voltage is key to a good sounding amplifier. The new power supply of the soulution 711 stereo­amplifier is based on audio grade “switched mode” modules. Four units with 600VA each combined with highend storage capacitors (> 1,000,000 microFarad) provide enough power reserves that allow the 711s reproduce even very complex music signals with ease. Circuitry that does not process audio signals should not be able to influence them. That’s why we use dedicated power supplies for the ancillary stages. Power, mode and input functions are operated from front panel buttons. Power toggles between on and off states. Mode transfers control of turn-on to an associated preamplifier via soulution’s LINK system. Input selects the desired input and mutes the others. The front panel display indicates operating status. Comprehensive built-in protection ensures safe operation and long life. This includes a level limiter (soft clipping) as well as over current and overheat protection. The stereoamplifier 711 does have balanced and unbalanced inputs. Switches at the back of the amplifier allow to define the start options for the brightness of the display, the start-condition of the amplifier and the operation mode (mono or bi-amping).